Intelligence Official: Transcripts Of Flynn's Calls Don't Show Criminal Wrongdoing : The Two-Way A U.S. intelligence official tells NPR there are both transcripts and recordings of Michael Flynn's calls with the Russian ambassador and that they don't suggest he was acting under instructions. Then-national security adviser Michael Flynn is shown at the White House on Feb. 10. An intelligence source says officials have found no criminal activity in Flynn's phone call with a Russian diplomat. A current U.S. intelligence official tells NPR's Mary Louise Kelly that there is no evidence of criminal wrongdoing in the transcripts of former national security adviser Michael Flynn's conversations with Russian Ambassador Sergey Kislyak, although the official noted that doesn't rule out the possibility of illegal actions. The official also says that there are recordings as well as transcripts of the calls, and that the transcripts don't suggest Flynn was acting under orders in his conversations. Flynn resigned late Monday, after allegations that he discussed U.S. sanctions on Russia with Kislyak and then misled Vice President Pence about the nature of those conversations. Flynn initially denied discussing sanctions at all, but in his resignation Flynn said he "inadvertently" gave Pence "incomplete information" about the conversations. 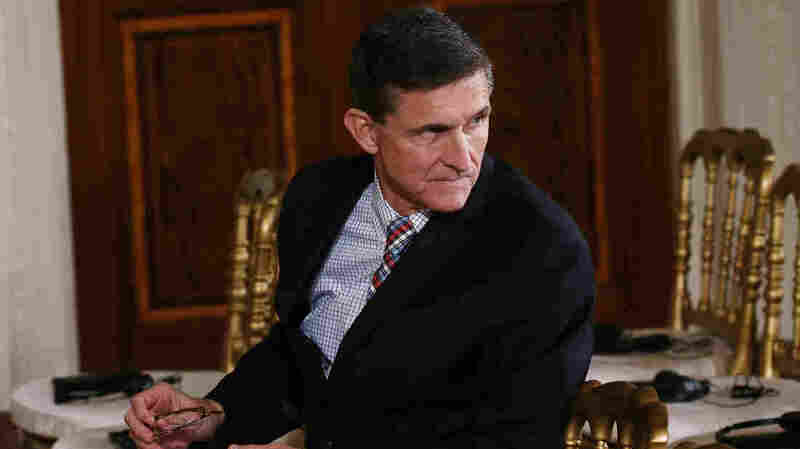 NPR's Phil Ewing previously reported that it is not in dispute that Flynn spoke with Kislyak in late December. "The issue is what he said," Phil wrote. Depending on the content of the conversations, Flynn could have violated a law called the Logan Act, which bars a private individual from conducting foreign policy without the permission of the U.S. government. For instance, if Flynn told the ambassador the Trump administration would drop the sanctions, that would have been illegal. The intelligence official who has personally seen the transcripts told Mary Louise they contained "no evidence" of criminal wrongdoing, although the official said it can't be definitively ruled out. The official also said there was "absolutely nothing" in the transcripts that suggests Flynn was acting under instructions "or that the trail leads higher." "I don't think [Flynn] knew he was doing anything wrong," the official said. "Flynn talked about sanctions, but no specific promises were made. Flynn was speaking more in general 'maybe we'll take a look at this going forward' terms." What Is The Logan Act, And Why Does It Matter? "The White House is confident Flynn didn't say anything that could have violated the law. Of course, that could be open to interpretation. It would be up to the Jeff Sessions Justice Department to review the transcript and bring a case, if it saw fit. That is seen as unlikely. "But there are other ways in which Flynn could be at risk.
" 'That raises the stakes of what so far has been a political scandal that cost Mr. Flynn his job. If the authorities conclude that Mr. Flynn knowingly lied to the F.B.I., it could expose him to a felony charge.' "